A little justification: I admit that the chances of me keeping this blog interesting and fulfilled with my developer oriented content alone are fairly slim. So I'm going to branch out a little, and do some game discussions and reviews, and essays, and what I think about games. So - perhaps use this as my soapbox, as it were, at some level. Are your manly senses tingling? They oughta be! 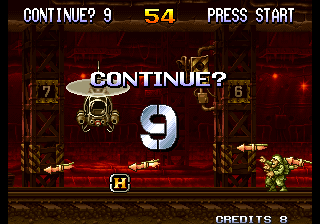 I spent the last hour or so playing the 1999 arcade game Metal Slug X for the first time in many years. 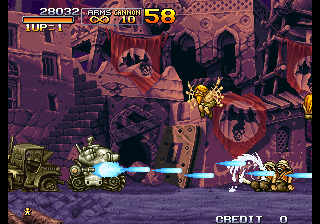 Metal Slug X is a (slightly) updated version of Metal Slug 2. It is a fiendishly difficult run-and-gun game, full of very light humour and gorgeous pixel art. I would love to fill you in in the story, but I struggled significantly to actually understand it. I'm not really sure what it was, other then running through a series of wonderfully drawn stages with guns and heavy machinery. The first stage puts you through a generic middle eastern area. With lots, and lots of guns. The game continues to fight through Mummies in a cave, aliens in New York (?) and an Arctic military base - finishing in the epic duel out against the alien ships. If you play like I do, then you'll spend most of your time shooting at them with the crappy pea shooter. Mostly because that's what you get if you die. 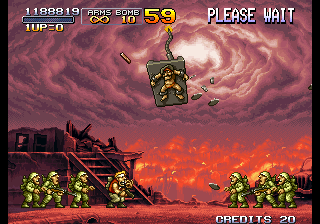 You'll spend significant amounts of time with the heavy machine gun, but more awesomely Laser Beams, Guided Rockets and Bouncy Bombs all make significant appearances. Particularly fun are the vehicle sequences - providing you can actually keep them in one piece. 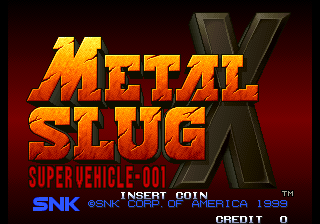 The Metal Slug is a large, laser shooting personal tank with the ability to jump, and some other pretty cool vehicles. Get used to seeing this a LOT! Whilst you may not be used to 2D in this 3D spoiled age, the graphics warrant a special mention. The pixel art demonstrates the absolute pinnacle of its style. Little details are painted right throughout the levels, and the level of detail on the sprites is just fantastic. I only hope that my pixel art for War of the Apocalypse Samurai can come somewhere even close. The Bad: This game is rather difficult. Good luck ever finishing it on one continue. 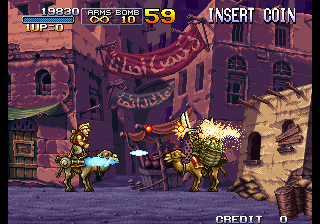 Also, the slowdowns that plagued Metal Slug 2 still rear their ugly heads - though less so, but still noticeably when there are lots of explosions etc. on the screen. Note that the game is rather short, however its cinematic quality and game style ensure that it is a very, very full short. It is well worth your time. 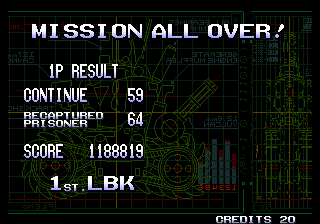 I played it using MAME, but I'm informed that it can be purchased on the Wii virtual console, or part of 'Metal Slug Anthology' for PSP, PS2 and Wii.